Immediately Accessible and Great Value – Free Quick Release Key Ring Included. 4 year shelf life (from the date of manufacture) – Double the industry average! High-quality hard polymer case to protect your phone from damage and scratches. High-quality polymer plastic cases protect your phone while providing full access to buttons and speakers. Made from durable high quality plastic. Designed specifically for the iPhone 4/4S. Allow full access to all the functions of your phone. Made with high quality. Protect your iPhone 4/4S from dust, strike and daily damage. Easy to install and take off. The phone remains fully functional and you can still access the charger port, volume buttons, etc. 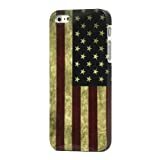 Package Includes: One brand new Loggerhead® Vintage American Flag Polycarbonate Hard Snap Case Cover compatible with Apple® iPhone® 5 or 5s (does not fit the 5c). Ships in Loggerhead ® retail packaging. Designed specifically for the Apple® iPhone® 5 5s. Does not fit the 5c. Quick and easy installation, snaps quickly to your mobile device for a 100% perfect fit. The case enclosure consists of shock-absorbing, high-grade polycarbonate (PC). Hard case shell offers maximum protection for your Apple® iPhone® device. Decorative case snaps easily to your mobile device, and allows for extra grip without extra bulk. Smooth surface protects against bumps and scratches. Many colors and designs available to personalize your Apple ® iPhone ® device. Visit our store for details. The Loggerhead® Vintage American Flag Hard Snap Case provides colorful style and maximizes protection, with its sturdy, hard shell rubberized polycarbonate material to protect your iPhone® without adding extra bulk. The smooth surface safeguards your device against accidental bumps and scratches and ensures a reliable grip. Form-fitting design and precision cutouts allow for easy access to critical controls, jacks, and ports.